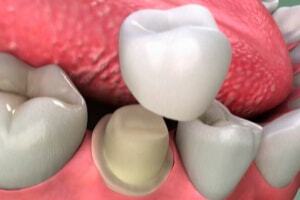 How is Your Tooth Prepared for a Dental Crown? Restoring one or several teeth to good form and function requires, besides other procedures the preparation of the teeth for placement of the indirect dental restorations (crown or bridge). The process of preparation usually involves cutting the tooth with special dental burs, to make space for the planned restorations and to remove any dental decay or portions of the tooth that are structurally unsound or unsupported. A dental drill (or high-speed dental hand-piece) is a small, high-speed drill used during dental procedures, usually to remove decay and shape tooth structure prior to the insertion of a filling or crown. The drills can rotate up to 300.000 rpm. They usually use a dental air compressor, hence the specific sounds that are heard when the drill is running. 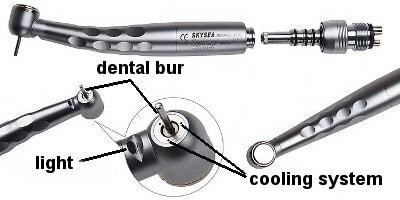 Modern drills have a cooling system attached and special devices to improve the dentist's visibility inside the mouth cavity. 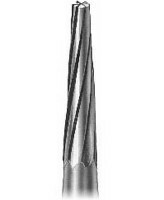 A dental bur is a type of burr (cutter) used in a hand-piece. The head of the bur contains the blades, which remove material. These blades may be positioned at different angles in order to change the property of the bur. Enamel and dentin are hard tissues that need special cutting tools for their preparation. Therefore, dental burs are usually made of extremely hard materials such as diamond or tungsten carbide. 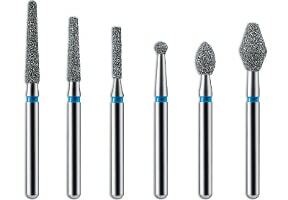 Various shapes of burs are available; these include round, inverted cone, straight fissure, tapered fissure, pear-shaped burs etc. Tooth preparation is performed using gentle moves of the dental drill all around the tooth until the desired shape and size is achieved. Normally, tooth preparation is performed under constant water-cooling to protect tooth tissues from excessive heat. The line where the preparation ends is called the margin. The margin of the restoration will be the future line of tooth-to-restoration contact because the restoration can only extend as far as the tooth is prepared. The line is an unsightly thing to have exposed on the visible surface of a tooth, therefore, the dentist would like to place the margin as far apical (towards the root tip of the tooth) as possible, preferably below the gum line. 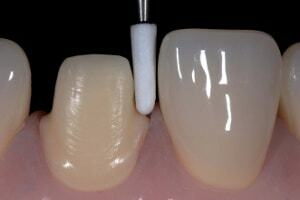 That is why, most often, the preparation is also extended slightly below the gum (a maximum of 0.5 mm). Will teeth preparation hurt ? No. The operation is performed under local anesthesia. Minor side effects may last a few hours after the session. What happens if more teeth have to be prepared ? If a dental bridge (or a partial removable denture) is designed, there are more abutment teeth (at least 2). The teeth can be prepared during the same session or, if it is estimated that the operation will last very long, in two consecutive appointments. 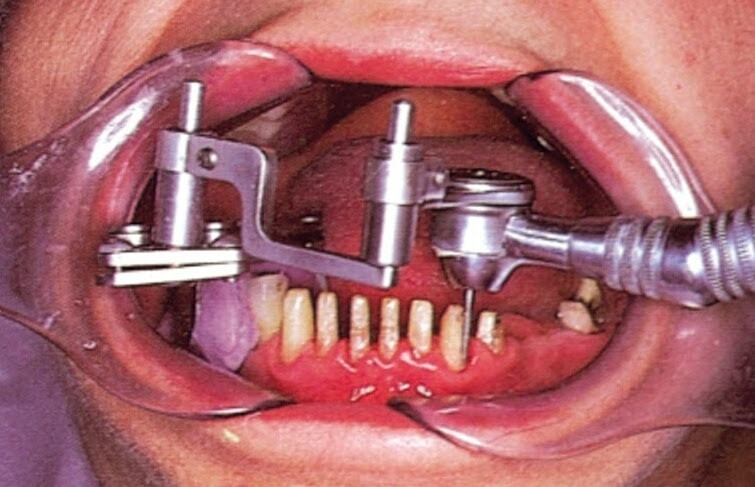 In such cases, it is important to ensure that all abutments are parallel to each other. Usually, experienced doctors have little problems in reaching this goal. For extremely difficult situations, special devices that help the dentist are available (image below). 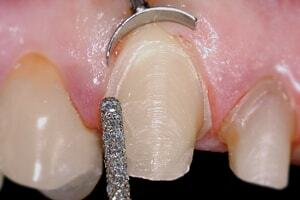 Should a tooth be endodontically treated before the preparation ? Endodontic therapy on a tooth is a decision that depends on the clinical situation. Whenever possible, it is preferable not to perform a root canal intervention if there is not a good reason. Why? It is well known that endodontically treated teeth are often missing significant solid tooth structure and become less resistant. However, there are clinical situations when an endodontic treatment is unavoidable (for instance, when, for various reasons, more of the tooth structure will have to be removed during the preparation). What if the tooth is broken ? What if the tooth shows advanced destructions ? If the decayed tooth has preserved enough of its original structure, a direct buildup with a composite filling material may be performed. After that, the preparation is conducted as usual. If the tooth shows advanced destructions, a post and core has to be manufactured and the dental crown (or bridge) will be supported by the post and core. After the fabrication, the post and core is cemented inside the root canal. In these situations, the core is already shaped at the dental laboratory (see post and core procedure). Therefore, the preparation is limited to small adjustments in order to give the core the desired final shape. 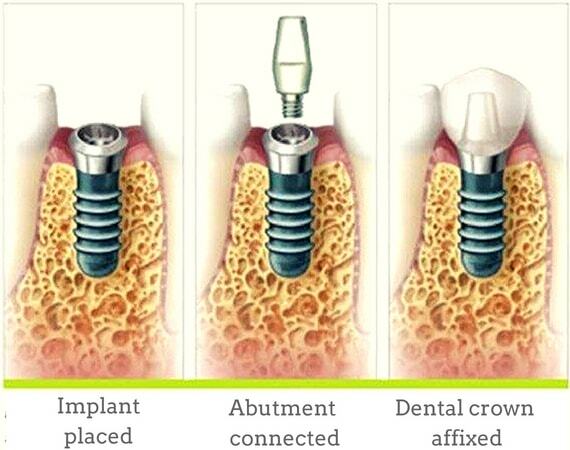 In case of a dental implant, after the integration process, an artificial abutment is screwed inside the bone implant. There is no need for preparation; after the abutment is connected to the implant a dental impression is made and the crown is manufactured. If local anesthesia was performed, there will be a feeling of "numbness" on that side. This sensation usually disappears in 2-3 hours. Light pain in the gums around the prepared teeth. To make the margin of the preparation as little visible as possible, a slight penetration below the gum is required. Usually, no medication is needed although some minor pain relievers may be indicated. If no temporary restorations were designed, an increased sensitivity to thermal stimuli (cold or hot) or food stimuli (sweet, sour) may be felt. Mild pain relievers can be prescribed. If a temporary restoration was designed, it is possible to feel pain or discomfort when biting down on something. In these situations, the temporary restoration needs a bite adjustment at the dental office. !! !If pain is intense and appears suddenly, especially if it appears during the night, it is advisable to contact your dentist. If a prepared tooth was not endodontically treated, sometimes, during appointments, a pulp inflammation may occur. Endodontic therapy is required.